Painting Accessories from Hyde, Merit Pro, Rubbersetat, DAP & More. 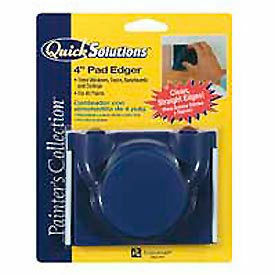 Rubberset® Quick Solutions Pad Painters Pad and Accessories Keep Trim Work Neat for Larger Painting Projects. Pad painters have threaded handles and beveled edges made for lap siding for user comfort and high performance. Quick Solutions Pad Painters are designed for use on various projects with all paints. Other paint accessories include 3-Piece Trim Tool Kit, Replacement Pads, Trim Roller, Lambskin Stain pad, Pad Edger, Refill Kits, and more. Sizes vary per item. Sold in package quantities of 1, 6, 12, and 24. Removing dust from painting substrates is a key step of the preparation process. 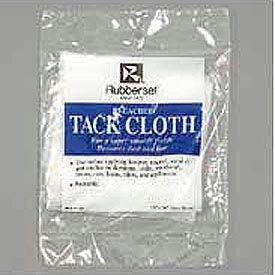 Tack Cloths have a tacky surface used for removing dust and other particles from your surface prior to painting. Used for use after sanding. Recommended to clean surfaces before painting. Construction, size, and color vary by model. 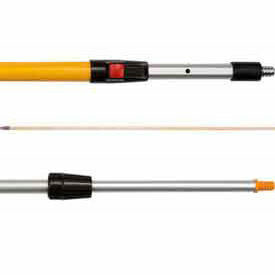 Extension Poles Provide Added Reach For General Or Professional Painting Applications. Extension Poles are made of Solid Hardwood and Metal for long lasting strength and durability. Poles come in a variety of sizes and styles. Telescoping extension Poles come in a combination of Fiberglass and Aluminum with Push Button or Twist Lock devices and a selection of lengths. Bucket Grids Keep Paint On Rollers Neat And Even. 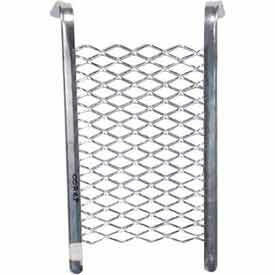 Bucket Grids are made of corrosion resistant, high quality, welded metal for long lasting durability and dependability. These grids are designed to hang from standard bucket lids to help increase painting productivity. Handy grids are securely placed in paint buckets to remove excess paint from rollers. 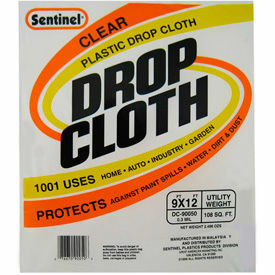 Protect Your Floors And Surfaces When Painting Drop Cloths help prevent staining and messes from paint splatters, spills, and drips. Large 9' x 12' tarp plastic sheeting is smooth and translucent. Flat packs come in Light, Medium, and Heavyweight Mil. thickness. Available in Package Quantities of 1, 12 and 24. Paint Accessories Are Used For Commercial, Industrial Or Residential Painting Applications. Paint Accessories are made of premium materials including natural sea wool sponge and more. 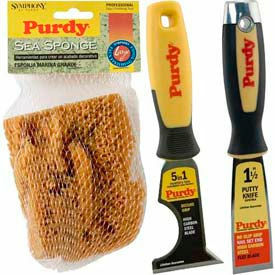 Accessories include Brush, Bucket Grid, Joint Knife, Putty Knife, Scraper and Sponge.